About 1775 a son was born, of a Shawnee mother and French trapper, whose life was to become woven into the fabric of western history. Hired by Lewis and Clark as a hunter, he served well with this expedition. Then he returned to the Rocky Mountains in 1808 to trap and trade furs for the newly formed Missouri Fur Company under the leadership of Manuel Lisa. After returning from this trip, to the upper Yellowstone River country, he platted the maps, including the Bighorn Basin of Wyoming for William Clark. Returning in 1810 to the headwaters of the Missouri River as a partner in Lisa's Fur Company, George Drouillard and two Delaware trappers were ambushed and killed by Blackfoot Indians at the Three Forks of the Missouri River. 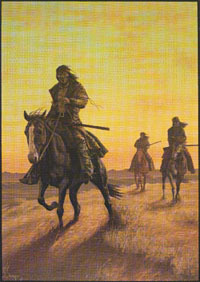 They were not rescued because their companions could not hear the gunfire through the shrieking prairie wind.